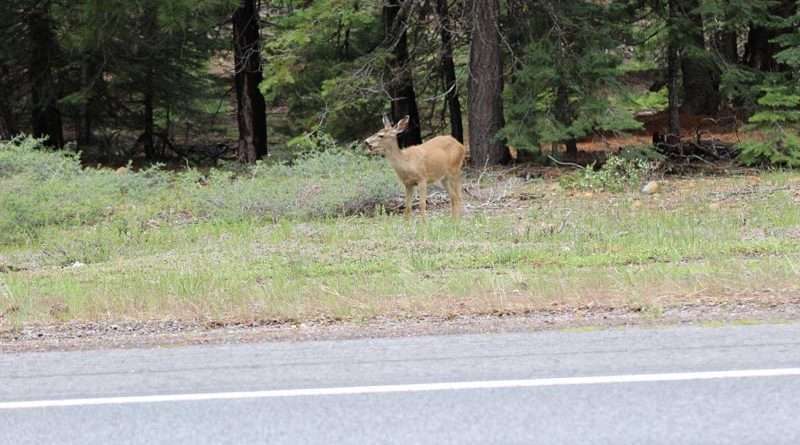 After a rainy winter, deer have abundant mountain grass and other plants to eat this year, so expect numerous sightings as you drive along the roadways in Plumas County. Forest animals, including deer, bobcats, bears, even squirrels, may appear crossing the roadway unexpectedly, and their actions can be erratic and unpredictable. The local deer population in particular has currently made their way back from the lowlands to make a grand appearance this spring in the forests and meadows of Plumas County — dashing across and sometimes stopping in the middle of the roadway. The American Automobile Association encourages drivers to use caution and remain alert to avoid becoming involved in a collision with wildlife. There are more than one million collisions involving deer and other animals per year in the U.S., according to the Insurance Institute for Highway Safety, sending 10,000 people to the hospital with various injuries — some quite serious. In addition, the IIHS reported that deer-vehicle collisions in the U.S. cause nearly 200 fatalities annually, and $4 billion in vehicle damage. USFS Wildlife Biologist Coye Burnett offered some basic advice should drivers encounter deer on the road. She recommends that drivers stay vigilant for any sign of deer or other animals in your periphery. She further cautioned drivers to avoid evasive action at the last second even though deer collisions can cause extensive vehicle damage. “Drivers should avoid swerving or leaving the road,” she advised, which can result in hitting a tree, going off a cliff or crashing into other objects, potentially resulting in serious injuries. If time permits, honking your horn might startle the deer enough to cause it to quickly leave the roadway, Burnett added. She noted that the appearance of one deer on the roadway likely means that other deer are nearby — possibly young fawns or yearlings waiting to follow their mothers across the road. However, if it seems like you can’t avoid hitting the deer, “you may have no other choice than to just hit it,” preferably at a reduced speed. It’s safer to hit a deer, Burnett explained, “than to risk crashing into a fixed object such as a telephone pole or oncoming traffic.